Fundraising via Social Media: Yes or No? The short answer: Absolutely you need to be asking for support (ie, money) from your community! And maybe they will, but most likely they won’t be turned off if you ask in the appropriate (and strategic) way. In his article, How Nonprofits Can Raise More Funds, Jay Frost explores this disconnect between appealing to corporations and your offline community the same way you appeal to your online community. Remember you’re selling something you believe in. Every good salesperson who is really successful is selling something they really believe in. Why not charities too? The Red Cross sells its services to the public – the service of providing support for communities in need. Because we trust the brand we are happy to provide resources to fulfill that need. This is the disconnect with social media, in that many people in nonprofits are only interested in having conversations and reluctant to ask. Think outside the box, how can you break your donations down into actionable items your nonprofit will take with their money? What are other ways you can break down your expenses? Think of your annual events -how do you generally approach sponsors? “Hey, we need the location donated, water donated, food donated, etc” Why not approach your community in a similar way that help elevate your cause? What is it that you do? What would be helpful? Myth: Asking for money and donated goods too much leads to lost donors. Earlier this week Agitator published an article that goes into detail about how frequency matters, but you can ask more often than you think! While we can all agree, it can get annoying to be constantly sold to you need to make sure you aren’t shying away and losing an opportunity for people to act on their desires. Just like too many appeals is detrimental, so is not enough. What does that look like for your organization? How often are you currently asking for volunteers, donated goods, or money? Are you? Are you not? How could that change? What works for one organization may not work for you – that’s the beauty of your personal online community. If you know their habits you can talk to them in a way they’ll respond positively. Beth Kanter (nonprofit marketing guru extraordinare) wrote a great piece on online fundraising. I highly recommend it. Again, think outside the box: Could you set up a weekly call to action? Say, every Friday afternoon at 3pm on your social media sites you set up “Friday’s Rescue” or “How You Can Help This Week.” Each week it could be something different – look up at your ideas from earlier? How did you break it down? Can you ask your community to give up one drink on their Friday night date for your organization? How far would that $6 go? Quantify it, make it personal. One of our nonprofits sends out an email every Sunday night saying “Things We Could Really Use This Week” with a list of services and volunteer opportunities in the next week that would be helpful. They can’t help if they don’t know where/when/how you need it! Maybe some cannot donate, but they can certainly cheerlead and be your fundraising champions! We all know that a friend asking for a donation is 70% more successful than an appeal from the organization. This last week Russell Simmons raised over $10,000 by asking people repeatedly on his twitter to donate to Life Camp, an anti-violence nonprofit in NewYork. Who are influential people in your circle? Can you mobilize your community to be engaged and solicit in your behalf? And remember with EVERYTHING online it is 80% goodwill, 20% self promotion. Make it about your community and your cause, not about you. 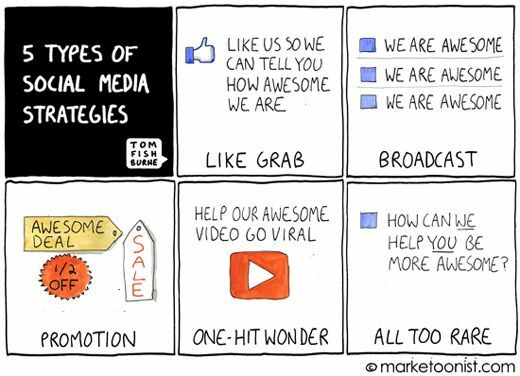 Try your best to be in the bottom righthand corner – that’s your ticket to social media success. How is your organization using online giving? What suggestions do you have?